The 7.62x54R is a very potent cartridge, in the same class as the 30-06. This round has excellent intrinsic accuracy as well. The bullets used in the military variants have a particularly elongated shape which results in a significantly high ballistic coefficent contributing to very good long range performance and high retained energy, close to a .300 Winchester Magnum round past 500 yards. Data for the 185gr FMJ bullet boat tail fired from a Dragunov sniper rifle shows a retained energy of circa 750 ft·lbs at 1000 yards, roughly the same of a commercial 44 Magnum round fired from a revolver at the muzzle. When used with modern hunting bullets, it is capable of taking large game comfortably. In Russia, the 7.62x54R is commonly used for hunting purposes mostly in sporterized Mosin-Nagant rifles. The Armory stocks a wide range of 7.62X54R ammunition to satisfy the needs of plinkers, hunters, competitive shooters, and the avid ammunition aficionado. 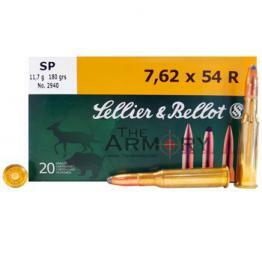 Being avid shooters ourselves, we enjoy trying out new 7.62X54R ammunition and try to offer you 7.62X54R ammunition at very aggressive prices so that you can share in our most favorite pastime. Thanks to the miracle of Just-In-Time Distributing (JITD), I can also take special orders for almost any PMC, Winchester, Federal, Remington, Wolf and surplus military.